Hi guys! I have the great pleasure and honor to present to you another cheesecake-monstrosity (in a good way!) from Dylan, creator of the now-classic Chunky Monkey Protein Cheesecake recipe (if you haven’t printed/saved/pinned that recipe, click here to get it in all its chunky glory.) Enough from me though; mic over to Dylan! When Anna and I spoke about doing another guest post I was ecstatic and immediately started brainstorming some more original ideas I could offer. 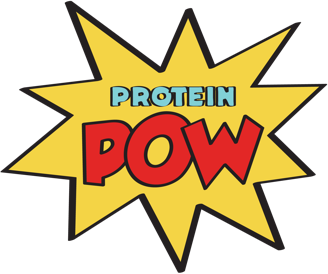 After all It’s not easy to stand out on a site like Protein Pow with its vast repertoire of perfected recipes, hehe. As with my last guest appearance here I made a Cheesecake. I am calling it a Sprinkled Strawberry Shortcake Cheesecake; and it is best described as Birthday Cake meets Strawberry Shortcake. It’s dense, it’s rich, it has a crushed Birthday Cake Cereal crust, strawberries, and I even frosted this cheesecake to really complete the package. POW! 8. Bake at 350 for 42-45 minutes, It is finished when a toothpick comes out clean or the sides start to brown. Macros per slice, out of 10: 175kcals, 15g protein, 12.6g carbs and 6g fat!